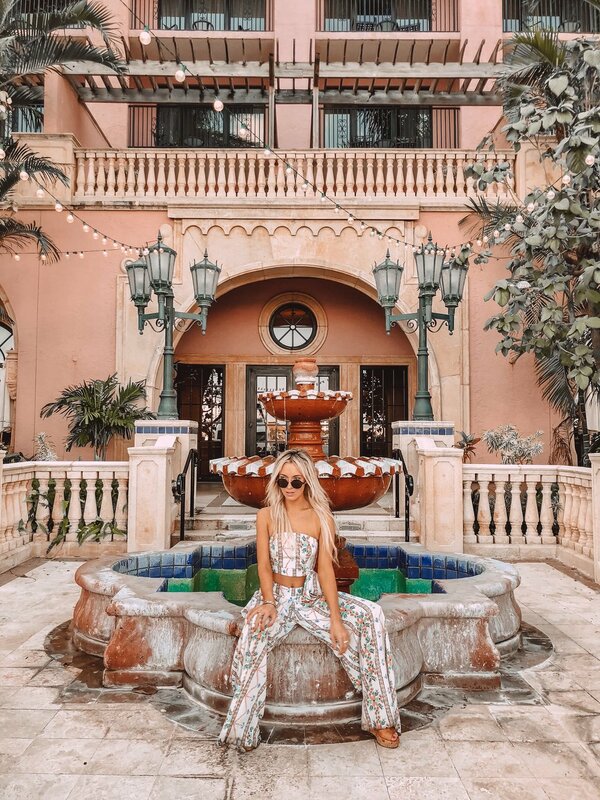 I had the absolute pleasure of collaborate with one of my FAVORITE hotel chains, Waldorf Astoria, when the company invited me to stay at the Boca Raton Resort. If you are in the Boca Raton or Palm Beach area, visiting this hotel is a MUST! From the staff and service to the decor and food, this hotel is unparalleled. With 5-star ratings, this private boutique hotel boasts oceanfront rooms and suites with a gorgeous "Pink Palace" color scheme. I stayed in a Yacht Club suite, which is a VIP room in the most exclusive wing of the resort that overlooks the glittering Boca Lake. I loved everything about the suite, especially the spacious bathroom, however the hotel is completely renovating these quarters for Fall 2018! According to their website, you can expect renovations to reflect "a fresh take on waterfront luxury with a concierge lounge like no other..." with delicate touches that allow you to experience the best of South Florida’s resort life...such as custom tastings and mixologist events, private and exclusive check-in, and more. WHERE TO EAT: The Blue (27th floor of the tower at the Boca Raton Resort & Club) offers a seasonal menu that features the freshest New American fare and seafood with a focus on sustainability. Try their "claw bar" which includes lobster claws, U-12 shrimp, stone crab, Pacific and Atlantic oysters, and king crab legs.The food was great, but the view was what we stayed for. This restaurant offers one-of-a-kind panoramic views of the entire resort. Insiders tip: head here to watch the sunset. The bar & lounge offers the perfect skyline view during Cocktail Hour (Monday-Friday 5-7pm) where they serve $7 cocktails and bar bites! WHERE TO UNWIND: Don't leave without checking out the Waldorf Astoria Spa. This world-renowned spa has a beautiful (and award-winning!) indoor grotto with decadent mineral baths. Renew in the steam room, sauna, and inhalation rooms, or book a facial! Outside, order champagne and fruit by the pool (like I did) and relax in the sun. You deserve this!